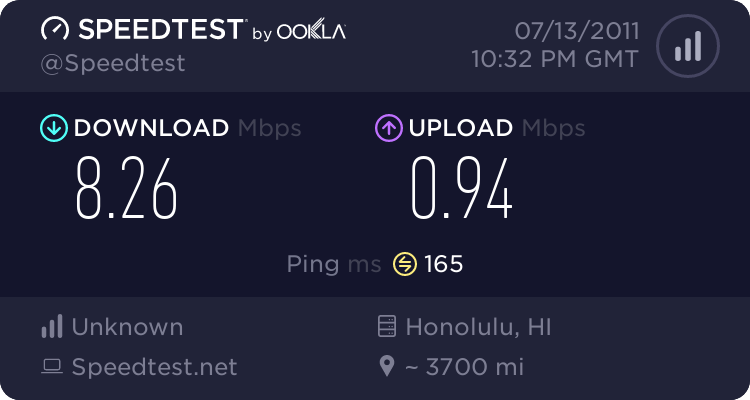 Anyone have HawaiianTel Com or Clearwire as their ISP? Just wanted to hear your testimonials on their services. and i havent tried their free wifi hotspot deal, but i think it's included, i just dont know where lol. the HT hotspots are available at any coffee bean and tea leaf shops. your master email address and password (hawaiiantel.net) is required. depending on what central office you get your phone service from walter will determine which one you would go with. I honestly don't like clear service. This is a completely NON BIAS answer. I use a clear hotspot almost on a daily basis for work when I'm out an about. 4g isn't that great. I'd try it and see how it goes. I have HT DSL - the naked DSL they call it with no dial tone. I had it for about 3 years. Before that, I had Roadrunner. Honestly, I like HT's DSL better. 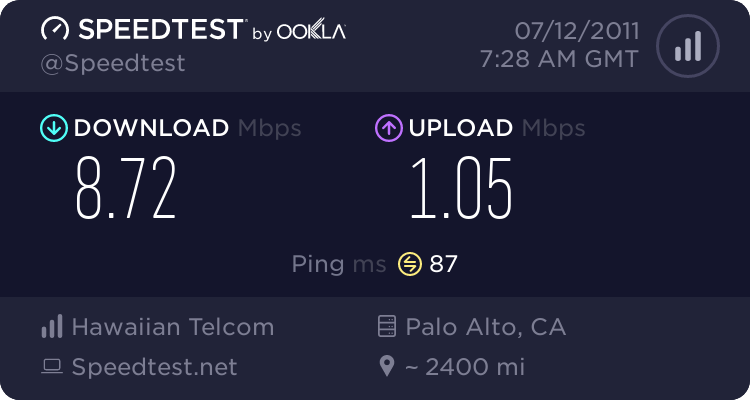 Better speeds (period). I hated Roadrunner's speeds. Totally sucked. I joined HT when they first started the naked DSL service, when they had a promo to offer the highest possible speed for $39.99 per month. I live near a CO so I have the 11M/7M service. Of course, real world is not quite that much. I ran a test a while back and I remember I got 6M/3M consistently. I'm pretty happy with that. Hey Walter, LMK if you wanna try Clearwire service. We average between 3-6Mbps with speed burst up to 10Mbps...I thought you knew by now, I'm Clearwire's longest running employee with the Hawaii Market. I manage the Clear Keeaumoku Retail Store. If your intrested, we have this new 4G Personal Hot-Spot device called the Rover. I can also give you a great deal... Besides the 30 day return policy, it comes with Unlimited download data, Unrestricted Download speeds, connect up to 8 devices, ect....Also, It's regular price is normally about $100 for the device, but I can sell it to ya for $25, as long as I have my backup stock on hand. Service is about $45 a month...LMK if your intrested, you got my number bro. Either way, I'll see you on the cruise!! Shoots. Last edited by Haole-Pino; 07-13-2011 at 12:59 AM. 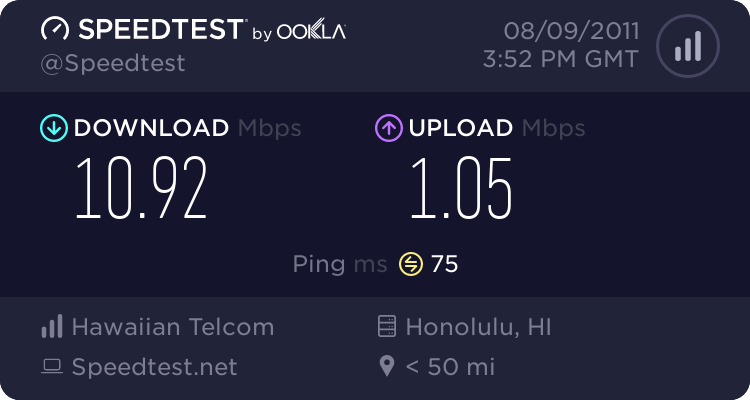 Heres my speedtest to Honolulu. Last edited by Wunder; 07-13-2011 at 01:34 AM. I'm with HT and have their 11/1 plan. They've been really good to me so far. Only prob I had was with my wireless router which needed to be replaced anyway because it was a relic. Here's my results. Used all three and decided to stick with RR Turbo. When I bought the new place, I got Hawaiian Tel's 11Mbit line, with the sales guy telling me that my place qualifies. It worked for 4 days at close to advertised speeds, then one day, no signal return. Took a few days for a technician to get to my ticket and when he got to it, he dropped it to 5Mbit and it didn't work. Dropped it to 1.5Mbit and it finally worked. The technician claimed that where I live was too far(10k ft max?) from the node and even when their computers say it is within the range, it wasn't. He asked me if leaving it at 1.5Mbit was okay. Hell no, I'm not paying 11Mbit price for 1.5Mbit. Regarding Clear, they recently dropped all retail and went into business sales. My cousin who owned 2 Clear kiosks jumped ship because sales were horrible and now is selling Oceanic. For Clear, it's all about where your antennas are. 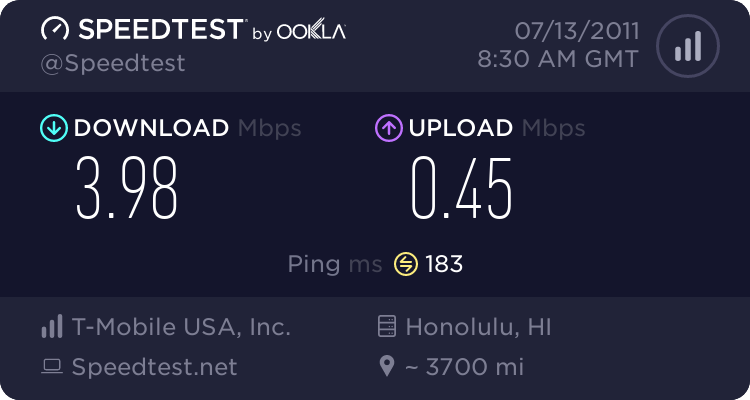 Quick Reply: Anyone have HawaiianTel Com or Clearwire as their ISP?